I didn’t grow up with casseroles. I’m not sure exactly why, but somewhere along the line, casseroles got a bad name. 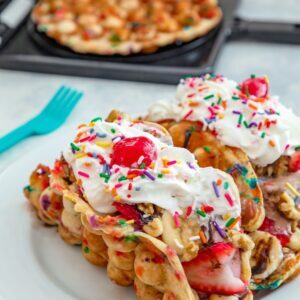 In my mind, the exception to this is mac and cheese (which come on, mac and cheese is totally a casserole in disguise) and breakfast casseroles (because eggs and sausage cannot and will not ever get a bad name). I don’t personally have an issue with casseroles, but because I didn’t grow up with them, I don’t ever think to make them now. Also, I’m not sure that I’ve ever in my life had tuna noodle casserole, which I’m pretty sure is the most discussed casserole of all. It’s also probably the one that has the worst reputation… But I’ve always thought it sounded kind of appealing. 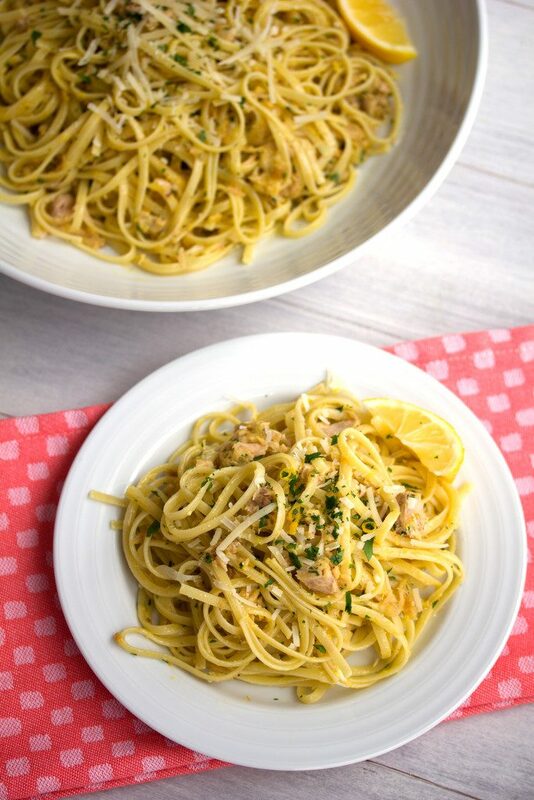 Tuna and pasta? How can that ever be a bad thing? When Genova Tonno asked me to create a recipe using their light tuna in olive oil, I had a million ideas running through my head. But this weather has me seriously craving pasta all of the time and I haven’t been eating it nearly enough. About five years ago, I think I ate pasta for dinner about four times a week. Pasta, a little bit of butter, some peas, and a whole lot of parmesan cheese. I slowly made the switch to whole wheat pasta at home, so I could eat larger bowls and feel OK about it. But now I rarely have pasta at home except on the occasional “I’m too lazy to cook” evening and didn’t plan anything in advance. 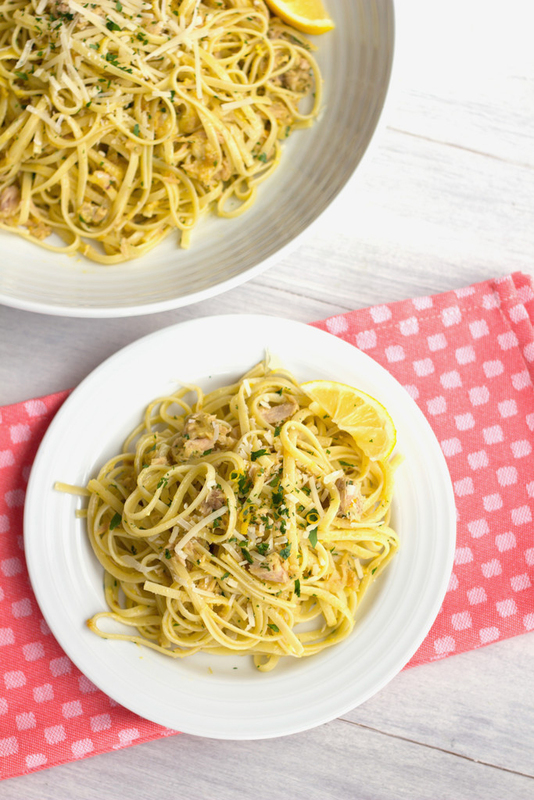 Tuna and pasta doesn’t have to mean tuna casserole. 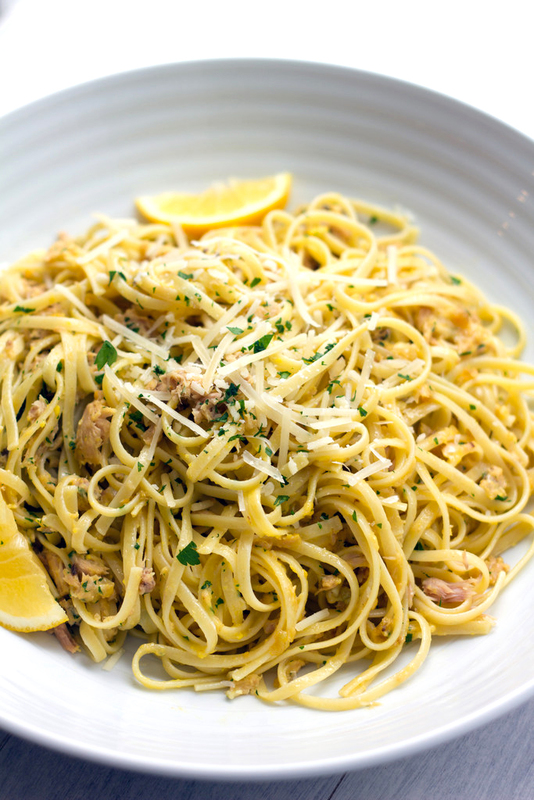 I think people turn to casseroles because they’re generally pretty easy to put together, but this Tuna Meyer Lemon Carbonara is also simple to make at the end of a long day. This isn’t your traditional carbonara as it doesn’t involve pancetta or bacon. I wanted to tuna to be the star of the show… Along with a little seasonal citrus! Genova Tonno sent me this BEAUTIFUL gift basket to help inspire me. AND they’re also giving one away to one of YOU! 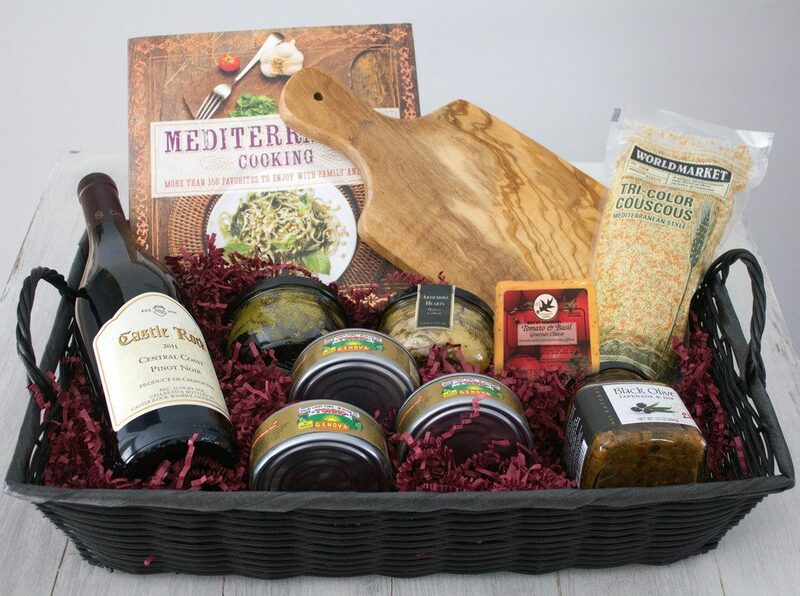 So, make sure you enter my giveaway a the end of this post for a sweet selection of Genova Tonno, the “Mediterranean Cooking” Cookbook by Pamela Clark, and Olivewood Serving Board from Sur La Table, and a few other glorious Mediterranean pairings. If you’re feeling ambitious, this dish would be even more delightful with homemade pasta. But check out the simple ingredients involved in this dish? You likely even have most of them in your kitchen as we speak. 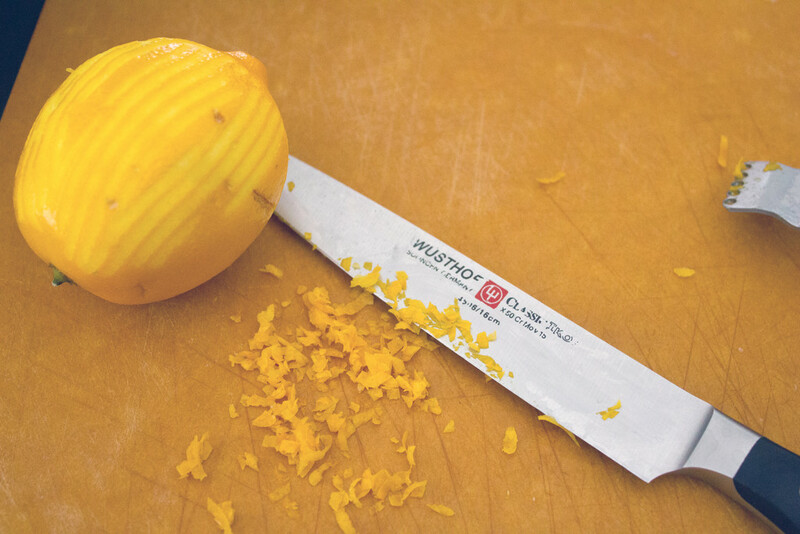 I TOLD you this was the week of zest and I wasn’t lying… I’m back to Meyer lemons again. ’Tis the season. I’ll admit that I’d never tried Genova Tonno before they sent it my way. But when I told my mom I was developing a recipe for them, she told me that my dad is a HUGE fan of the brand. After I tried it, I could see why! I think sometimes people are afraid of tuna packed in olive oil, but now that I’ve tried it, I’m not sure I want tuna in water at all anymore! Genova Tonno is premium wild-caught yellowfin tuna. The cans are BPA-free and have no additives or preservatives in them. The olive oil gives the tuna a richer flavor and I promise it doesn’t make the tuna feel oily. Also? Olive oil contains monounsaturated fat, which is nothing to be afraid of. 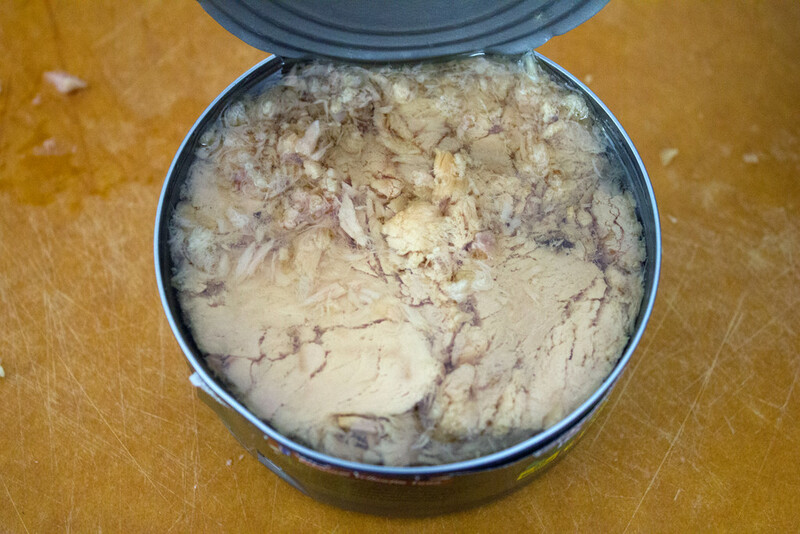 Can’t you already tell it looks way tastier than your average tuna? To start, get your 3/4 lb. 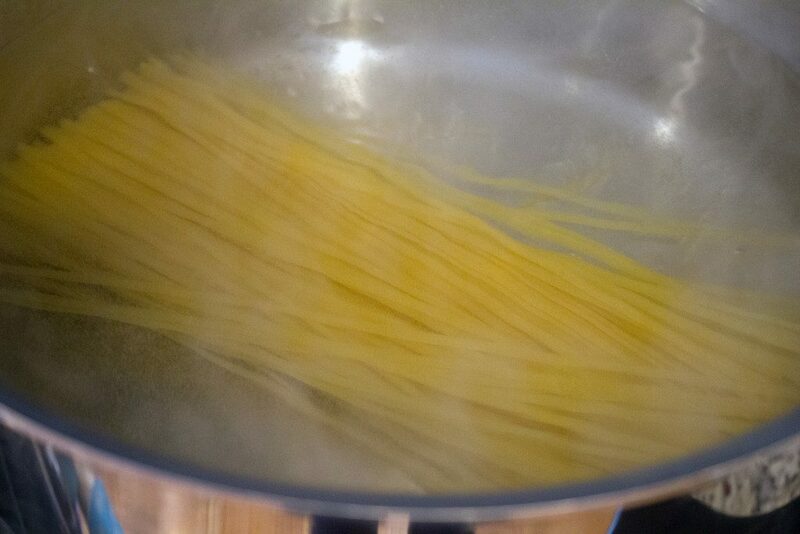 linguine boiling in some lightly salted water. You can obviously use whole wheat pasta if you want! Make sure you keep an eye on the pasta and just cook to al dente. While the pasta is cooking, heat 1 T olive oil in a small skillet over medium-low heat and add 3 cloves peeled and minced garlic. Sautée for about 30 seconds to a minute, until softened. 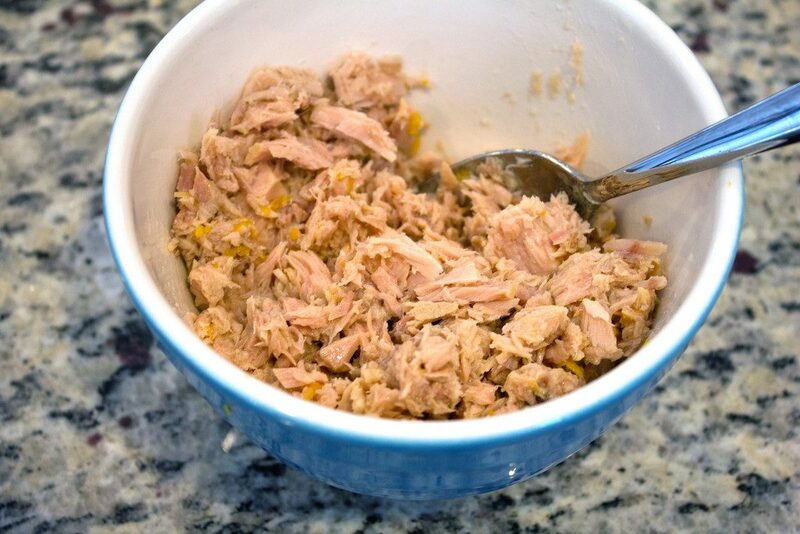 Drain the oil from two cans (10 ounces total) of Genova Tonno and place tuna in a medium-sized bowl. Mix in 3 T fresh Meyer lemon juice and 1 t Meyer lemon zest. 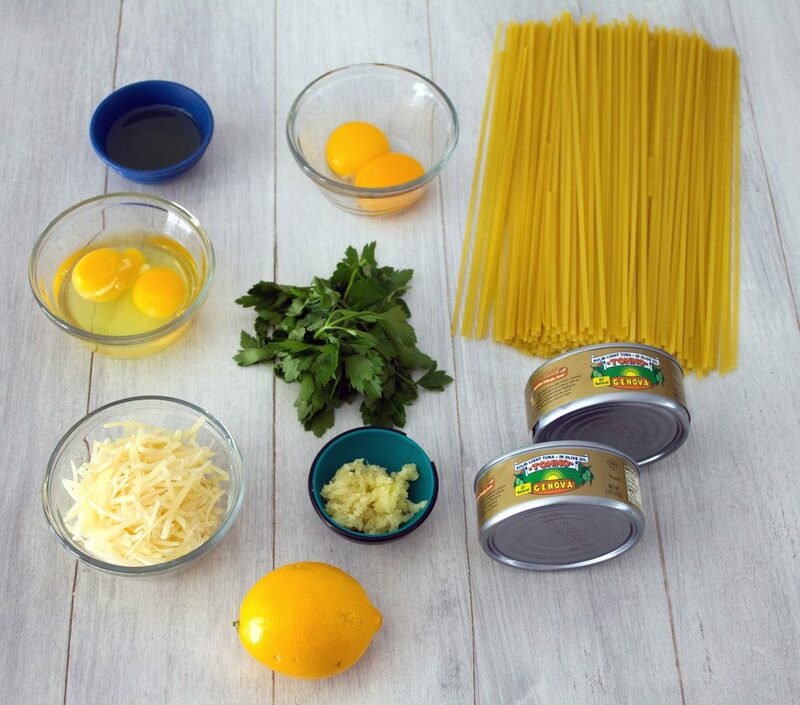 In a separate medium-sized bowl, beat 2 eggs and 2 additional egg yolks and mix 3/4 C grated parmesan cheese. Return drained pasta to the pot and keeping it off the heat, pour egg and parmesan mixture into pasta. Make sure to keep stirring as you pour, so the eggs will cook slowly instead of scrambling. 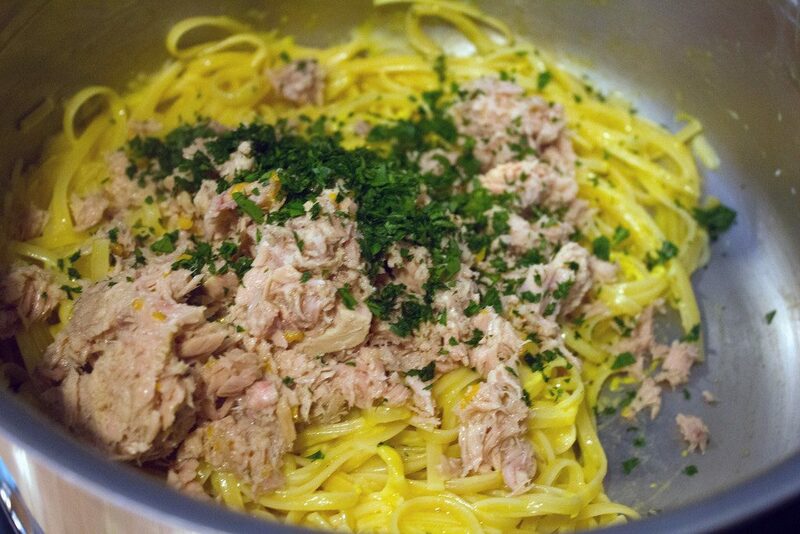 Mix in garlic, tuna and lemon mixture, and most of the chopped parsley. Serve pasta on plates, with additional chopped parsley and parmesan sprinkled on top. And some sliced Meyer lemons on the side. Dig in to pasta night! Like I said, I’ve never actually had tuna noodle casserole, but I kind of think this is better. Like a lot better. It’s making me wonder why I haven’t been eating pasta regularly. Which could be a good thing or a really bad thing. I’ll keep your updated. I also don’t know why I’ve never incorporated tuna into my pasta dishes before. All of that is about to change because now that I’ve done it, I’m never turning back. Tuna is not just for tuna melts anymore (and man, I love me a good tuna melt). Yes, I am still squeezing as much juice out of Meyer lemon season as I can. If it’s going to snow and be miserable out, I will overdose on winter citrus! And now, apparently, pasta. I love carbonara almost more than anything and at first I was a little bit worried that no pancetta/bacon would ruin a carbonara. But I had nothing to worry about because the tuna brought more than enough flavor, especially when combined with the citrus.. 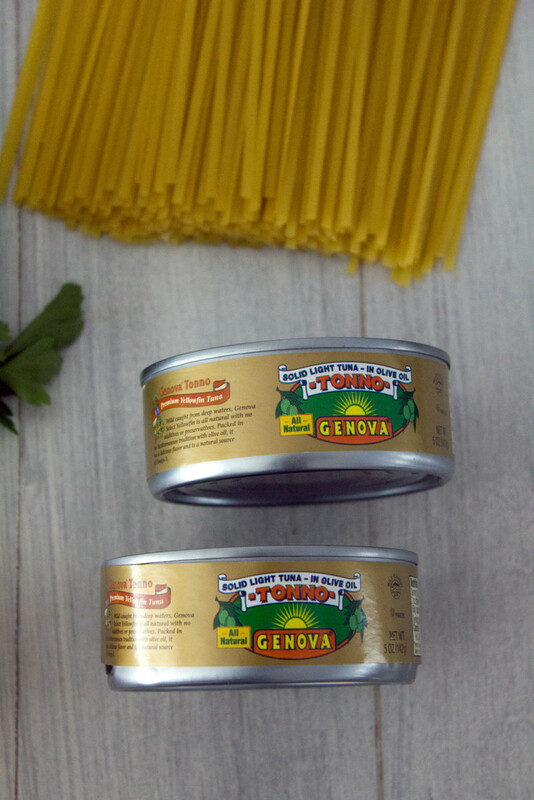 If you’re skeptical about tuna because you think it’s “fishy,” Genova Tonno is the one for you to try. Preferably in this dish. I don’t go on diets, but if I did, I would totally go on the Mediterranean diet. But I’d add a lot of pasta to it, too. And then I’d eat this every night until Meyer lemon season was over. At which point, I’d probably switch to some kind of summer citrus… key limes perhaps? Don’t worry, I didn’t forget about the giveaway for this beauty!! For a chance to win the above fabulous gift basket, all you have to do is comment on this post telling me What’s your favorite way to enjoy tuna fish? Enter by Tuesday, March 3, at 11:59 p.m. for a chance to win (must live in the United States to win)! In the meantime, I hope you’re cuddling up on the couch this weekend with a giant bowl of pasta. One week until Daylight Saving time!! 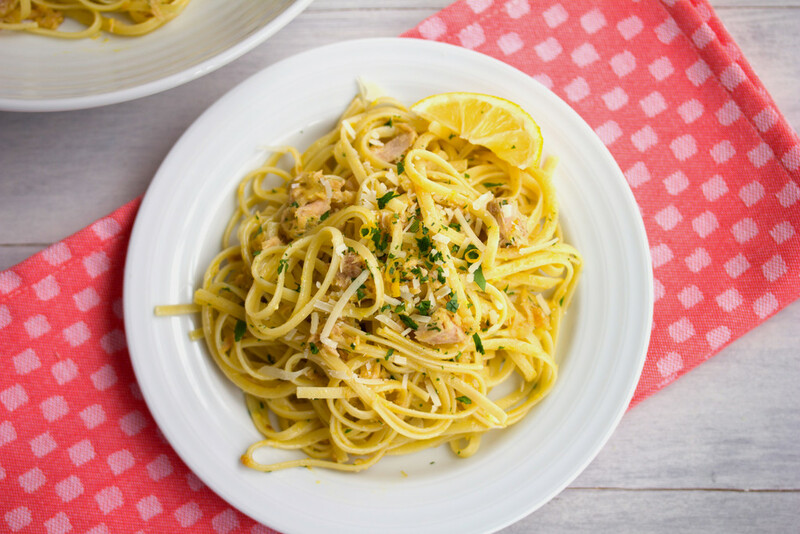 Two classic pasta dishes get some major updates in this light and fresh Tuna Meyer Lemon Carbonara. While pasta is cooking, heat the olive oil in a small skillet over medium-low heat. 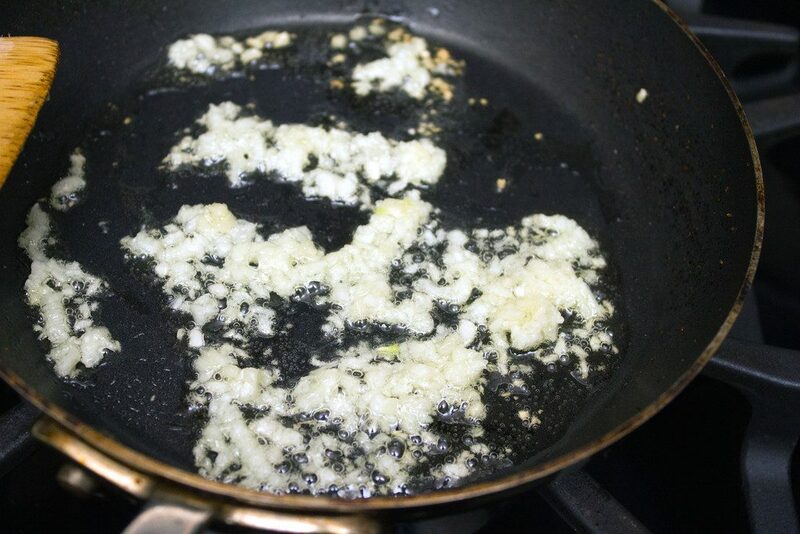 Add garlic to the skillet and sautée for about 30 seconds to a minute, until softened. 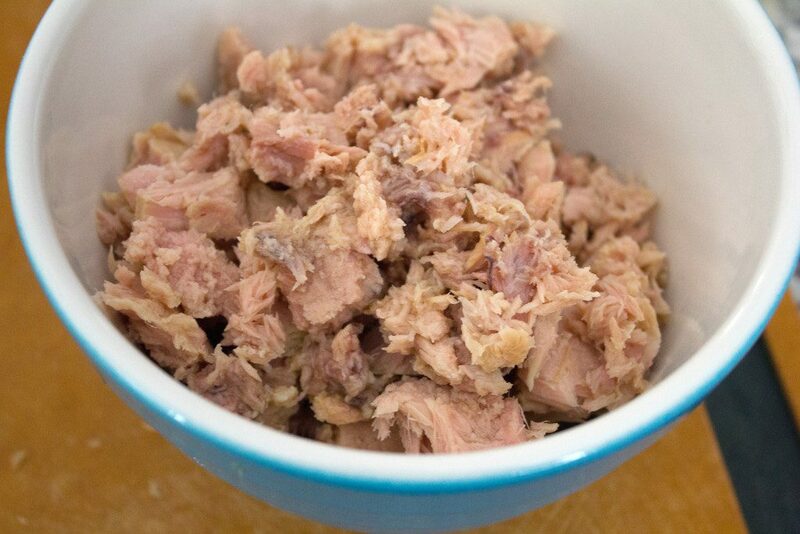 Drain oil from tuna and place tuna in a medium-sized bowl. Mix in meyer lemon juice and zest. In a separate medium bowl, beat eggs and yolks and mix in the grated parmesan. When pasta is al dente, drain water. Return to pot while still hot. Keeping pot off the heat, pour egg and parmesan mixture into pasta and stir well. 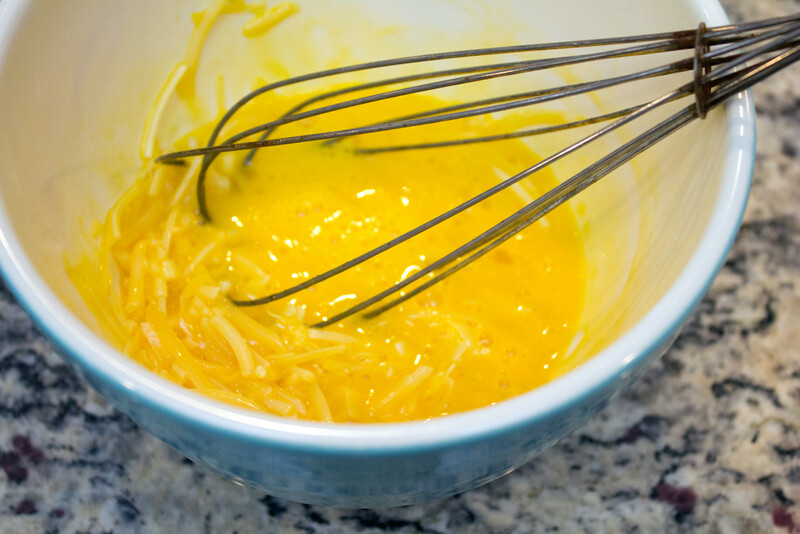 Stirring will allow the eggs to cook slowly and keep from scrambling in the hot pasta. Full Disclosure: Thank you to Genova Tonno for sponsoring this post. As always all opinions are 100% my own! 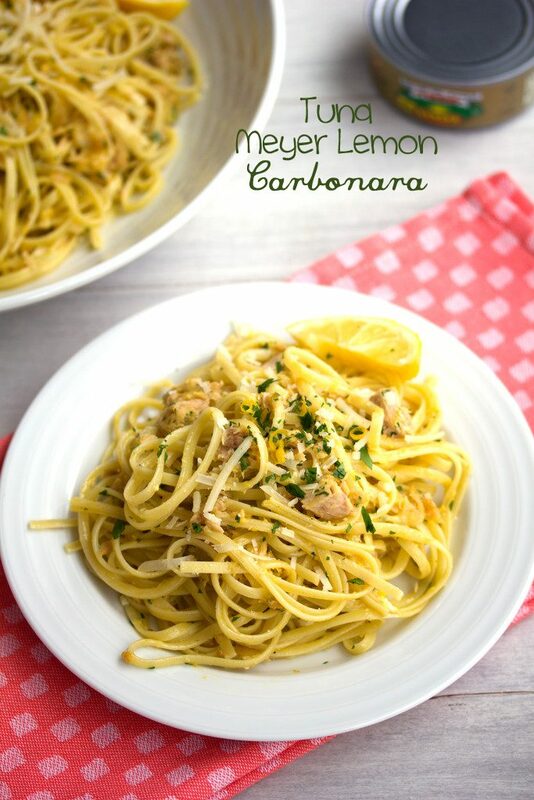 45 Responses to "Tuna Meyer Lemon Carbonara (and a Genova Tonno giveaway!)" I make a tuna and white bean salad with cranberries, celery, citrus vinegar, and scallions that’s a great healthy lunch ! I love tuna melts with tuna fish, cheese, and tomatoes broiled on good bread. I’m SUCH a sucker for a tuna melt. My favorite way to enjoy it is tuna noodle casserole. I love it! Tuna melts all day long! 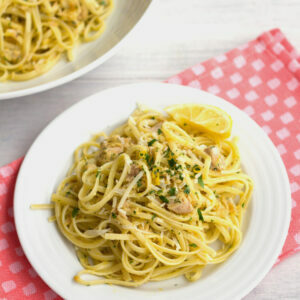 Cannot beat a little tuna added into warm pasta, so good! Genova Tonno has been my go-to brand for a while now. I love it over arugula with white beans, celery and tons of flat leaf parsley. I love tuna fish with thick slices of tomato between two slices of buttered toast. Probably one of my favorite sandwiches (next to grilled cheese, of course)! I love tuna every which way, but love it in a pan bagnat, with marinated artichokes, roasted peppers and olives. Soooo good! love tuna melts with tomato! Of course I love tuna salad sandwiches but I also like making fried tuna patties. Yum! I love a good tuna melt. This recipe sounds delicious! I love tuna salad sandwiches with garden fresh tomatoes and a giant glass of sweet tea. Yum! I like it in a sandwich with pickles. I just bought Meyer lemons and am so going to make this delicious recipe! I usually use canned tuna to make a classic tuna salad with chopped onion, celery, a little mayo, alot of lemon juice, sea salt and black pepper – YUM!!! I love a tuna salad with white beans and fresh basil! But I think yours is my new favorite. Will be trying it very soon. A good tuna salad with avocado is always amazing! Well tuna casserole is a childhood favorite. But all around it probably sounds boring, but I do love a good tuna salad sandwich. Cannot wait to try this out! I love tuna with pesto, lemon, fresh basil and diced tomato all over romaine! Never thought to serve with a warm pasta!! Occasionally we eat tuna in one of the “helper” meals, but my favorite way is just a plain old tuna sandwich. I make tuna salads in a low-carb wrap! 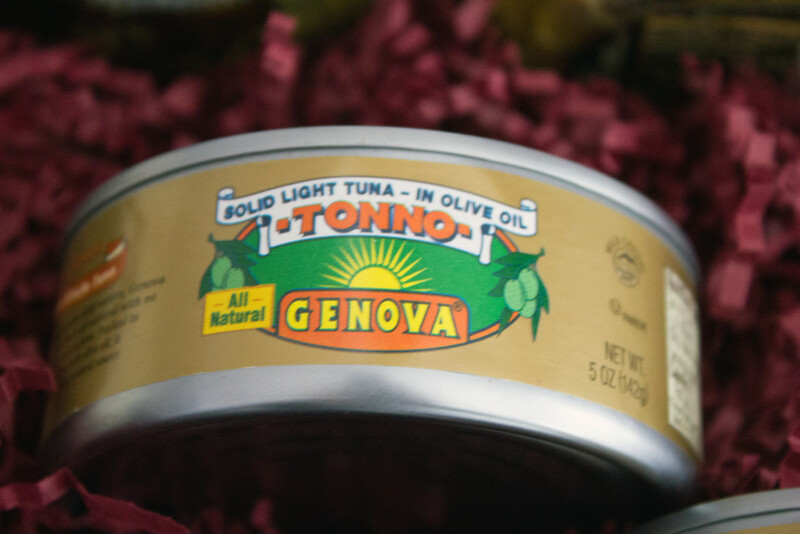 I love, love, love tuna…and I actually just discovered Genova Tonno at Costco recently and it’s my new favorite! There’s endless ways to eat tuna, but last summer I started eating it mixed with zucchini noodles, a good tomato basil sauce, olives, arugula, and some fresh parm! sounds weird, but it’s a pasta game changer! 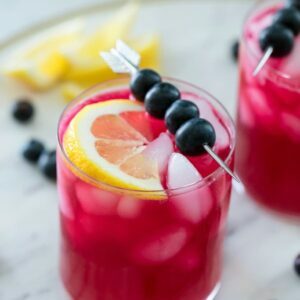 side note, how do you think this recipe would be with regular lemons instead of meyer? I agree with you on casseroles and I’m all for a Mediterranean diet with extra pasta! 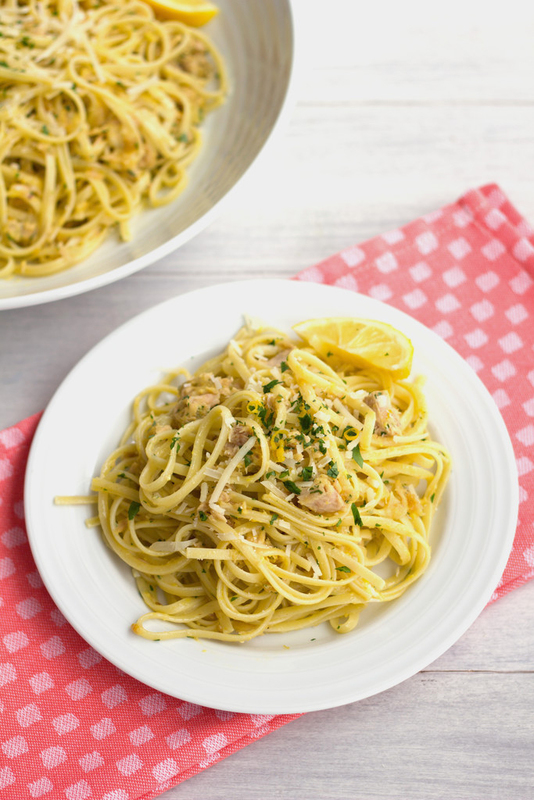 Love this combination of tuna with lemon and carbonara – there’s nothing better than pasta carbonara! Italian packed tuna with red sauce on a pizza is divine! I did grow up on casseroles and LOVE tuna casserole but this is a whole new twist and sounds delicious! 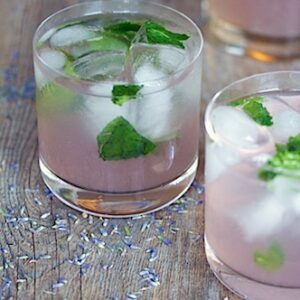 I have everything I need to make this and even a Meyer lemon on my tree! Tuna makes the perfect protein-packed topper to my lunch salads! 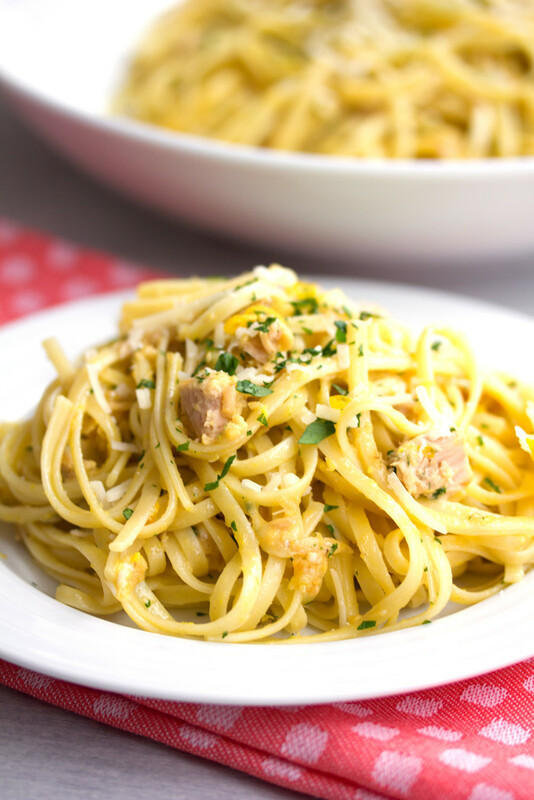 I love pasta carbonara, adding tuna to it is a new idea, and I think I will give it a try. Thanks for sharing. I like a simple tuna sandwich. Every once in awhile I will crave a tuna salad sandwich. Butter lettuce and cucumbers! Okay, I really only do tuna on a toasted English muffin, but after seeing all of the lemon trees in Sonoma last week, I’m totally wanting to try this! Also, totally wishing for a lemon tree in my yard…. I love tuna salad in lettuce wraps. I am a huge fan of Tuna Melts, but so want to try the recipe you just posted and will be making it whether I win or not! I like this giveaway A LOT! Especially the tuna and the wine part. 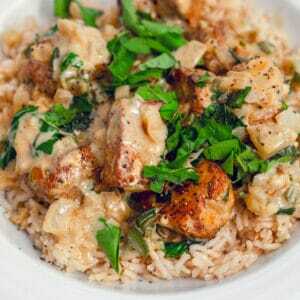 This dish looks so yumm– I would make it!!! I didn’t grow up with casseroles either, and now that I look back, I haven’t had them in my life nearly enough! Love this beautiful take on carbonara!